11 "A New, New Deal"
Amy B. Dean is a Chicago based activist. Dean revealed some of her background to attendees of the 55th Annual Debs - Thomas - Harrington Dinner, May 3, 2012, Chicago. I grew up on Chicago's south side and at a young age, I learned about redlining. As our family remained one of the last white families in Chicago's Jeffrey Manor, we watched as banks and independent brokerage firms seduced white Chicagoans to move to the suburbs while de-investing in our neighborhood and the city's urban core. I learned about how our opponents sometimes take us more seriously than we take ourselves when shortly after I got hired as an organizer for the ILGWU, our organizing director, Rudy Lozano had been shot and killed while in the middle of the Del Rey Tortilleria campaign. I learned about the contradictions and discrimination within our own movement as I watched Mayor Washington vie for the COPE endorsement from the Chicago Federation of Labor during his reelection campaign, although every Democratic mayor before him got an automatic endorsement when running for a second term. My own Jewish faith, and the traditions I've been raised with, have inspired and grounded my own activism. Again, in the words of Rabbi Heschel "Authentic faith is more than an echo of a tradition. It is a creative situation. It is an event." Dean began her career in labor working for the International Ladies Garment Workers Union during the 1980s. Later she lead the AFL-CIO in California’s Silicon Valley for a decade. New Party News Fall 1994 listed over 100 New Party activists-"some of the community leaders, organizers, retirees,, scholars, artists, parents, students, doctors, writers and other activists who are building the NP" the list included Amy Dean, San Jose CLC. May Day greeting was included in the Special May Day 1999 Supplement of the Communist Party USA's People's Weekly World. Greeters included Amy Dean. 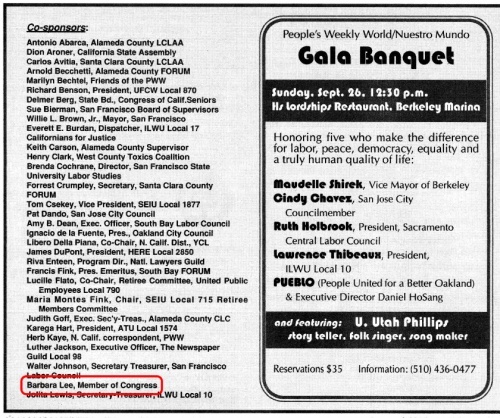 Co-sponsors of the October 8 2000 Bay area People's Weekly World banquet, at His Lordships, Berkeley Marina, included San Francisco mayor Willie L. Brown, the vice mayors of Berkeley and Oakland. Sponsors included Amy Dean, South Bay Labor Council and Walter Johnson, San Francisco Labor Council. Entertainment was provided by David Winters. In California in the 1990s, Dean helped to create the Children’s Health Initiative in Silicon Valley to provide healthcare for children. The Children’s Health Initiative, made Santa Clara the first county in America to offer health insurance to all children. In San Jose, the initiative created a public option, which is now almost ten years old. We’ve had every single evaluation possible—you don’t get big foundation money without being evaluated by outside evaluators—to demonstrate we had a success. The Chicago Communist Party USA 22nd Annual People’s World Banquet Dec. 6 2009, at the Parthenon Restaurant. Several thousand dollars was raised for the PW Fund Drive from "supporters who dug deep despite the hard economic times". The attendees, a rainbow crowd of labor, community and religious activists, entered the festive room to the sounds of the jazz trio, Lovers in Arms and a running slide show of photos from struggles over the past year. Author and labor leader Amy Dean keynoted the event. In introducing her, CPUSA labor secretary Scott Marshall called her work visionary and innovative. Dean recounted how she learned some enduring lessons as a young organizer for the ILGWU working with Rudy Lozano and through the election of Harold Washington as Mayor of Chicago, "including the kind of commitment it took to fight for worker’s rights, the need to build grassroots movements and win political power to effect real change". She noted while electoral coalitions are one thing, governing coalitions are often another. It’s vital that labor and its allies have a say in what policies unfold once their candidates are elected. Dean said much more must be done to build up the movement to ensure the Obama agenda and progressive change is advanced in Congress. Before the dinner Dean signed copies of her new book, “A New, New Deal: How regional activism can reshape the American Labor Movement” which she co-authored with David Reynolds. In 2009 Amy Dean’s book A New New Deal: How Regional Activism Will Reshape the American Labor Movement, which she co-authored with David Reynolds of Wayne State University, "offers a clear prescription for building progressive change from the grassroots: Labor organizations must transcend workplaces to make common cause with community organizations at the local and regional levels." Saturday, February 20, 2010 at Roosevelt University, 430 S. Michigan, Room 232, Chicago, a forum was held 'Obama Year One." In the aftermath of the historic 2008 elections and in the midst of the deepest economic crisis since the Great Depression, activists and progressives from across movements came together to push for a new New Deal. The new political and economic realities created new opportunities to mobilize for progressive changes including ending wars and militarism; promoting workers' rights; reforming healthcare; and developing economic policies that promote jobs and communities instead of corporate profits. There have been both advances and setbacks in these struggles. One year later, it's time to take stock of lessons learned, evaluate strategic goals, and plan for future campaigns. Join leaders of the labor, peace, immigrant rights, healthcare reform, and economic justice movements in assessing the past year and current political conditions to determine ways we can work together towards progressive change. On November 18 2010 Amy Dean was keynote speaker at the St. Louis: 7th annual Working class media & democracy forum, hosted by the the Missouri/Kansas Friends of the People's World / Mundo Popular. Keynote speaker: journalist and author Amy B. Dean, author of A New New Deal: How Regional Activism Will Reshape the American Labor Movement. Dean wilQ & A follows. Copies of A New New Deal will be available for purchase and signing. Contact for the event was Communist Party USA member Tony Pecinovsky. In 2011 Amy Dean wrote "A New Blueprint for Change:A revived progressive program must be built year-round, at the local level" for Democratic Socialists of America's Democratic Left, Winter 2010. As with Jesse Jackson 20 years earlier, progressives organized in 2008 around Barack Obama as a charismatic leader. Yet the effort left behind little in terms of lasting structure that could allow delivery on promised changes. Groups reinventing politics at local, metropolitan, and state levels take a different tack. These groups insist that elected officials see their role as helping grassroots movements successfully mobilize and push forward their demands on an ongoing basis. Progressives would be wise to take this message to heart. Unless candidates and local groups alike are continually expanding the political space and generating the political will for reform, the difference between the next Democratic administration and this one will be just as little as the difference between Obama and Clinton. And unless the local base begins to lead and national politicians follow, 1994 and 2010 will only be two dates within a much larger litany of setbacks. Chicago Democratic Socialists of America's 2013 55th Annual Debs - Thomas - Harrington Dinner was held on May 3 at the Holiday Inn Chicago Mart Plaza's Wolf Point ballroom. Amy Dean provided the Eugene V. Debs - Norman Thomas - Michael Harrington address for 2013. Tonight we find ourselves juxtaposed between those who are leading us into the future and some of our movement's greatest leaders of the past: Eugene Debs, Norman Thomas and Michael Harrington. Amy B. Dean is is the principal of ABD Ventures, LLC, a consulting firm that works with social change organizations to develop new and innovative organizing strategies that link advocacy and public policy reforms. 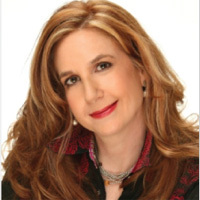 Her articles appear regularly in the Huffington Post, Alternet and Truthout, among other publications. She is coauthor, with David B. Reynolds, of A New, New Deal: How Regional Activism Will Reshape the American Labor Movement, a Century Foundation Book. From 1993 to 2003, she served as president of the South Bay AFL-CIO Labor Council, the fifteenth largest regional labor federation in the country, representing more ninety unions and 110,000 members, and was the youngest person and first woman to lead a major labor federation of the AFL-CIO. During that time, she established Working Partnerships USA, a nonprofit organization that connected sound economic research with strong community organizing. In 2005, she founded Building Partnerships USA, a national organization dedicated to increasing civic and political participation to strengthen democracy and advance social and economic justice at the regional level. This page was last modified on 26 November 2017, at 13:43.